I hear many gun owners saying we need to do something to affect the outcome of the next election, but I don't see any of them actually doing anything. Case in point: I recently attended a gun auction that is periodically held at an auction house in my home county. There was a representative from a gun rights group and a representative from a local gun club there, each had a table set up to sell raffle tickets. Neither of them had voter registration forms at their tables. With the auction house's permission and assistance, I set up a table and registered five new pro-gun voters. At the next gun auction, both of those organizations were there again; neither had voter registration forms at their tables. I registered three more pro-gun voters. Selling raffle tickets is fine, but it doesn't get pro-gun people to the polls. The time has come to stop talking and start acting. There shouldn't be a single gun related event where there isn't a table to register voters. If your pro-gun organization is setting up a table to take donations (remember selling raffle tickets is illegal in NYS), make sure you have a stack of voter registration forms on the table. Take a book of stamps, and offer to mail in the completed forms. Don't assume people will register on their own, many of them won't. Some people, especially those who haven't voted yet, don't understand how easy it is to register. Don't assume someone else is working on registering pro-gun voters, my experience has shown me they aren't. If you belong to a gun club, get your club involved. If not, act on your own. Get a stack of voter registration forms from your county Board of Elections office (they're free). Visit every gun store in your county and ensure they have a stack of voter registration forms on their counter top. Don't forget the archery stores, they're on our side too! A friend and I did this in our home county, it took only two hours to visit six stores, and all of them agreed to let us put out voter registration forms at their locations. By sticking to the gun/archery stores, we ensured we were only registering likely pro-gun voters. We were invited to two upcoming outdoor events sponsored by two of the archery shops in our county, to set up a voter registration table. If you teach a sportsmen's education class, devote 10 or 15 minutes to the importance of being politically active. While many of the students are too young to vote, they won't be forever. And these folks are our future! I put a stack of voter registration forms out in the back of the classroom, with the other course materials. Two key points to keep in mind, and to point out to people. 1 - If someone has moved since the last time they voted, they need to re-register. 2- If someone is 17, but will be 18 before the next general election (this November 8th), they can and should register to vote now. Even if you don't like the current candidates, I encourage you to vote and to get your friends and family to do so too. A vote for the "lesser of two evils" is better than allowing the candidate who is the most opposed to the Second Amendment to be elected. And keep in mind that you will also have the opportunity to vote for pro-gun politicians at all levels of government (town, county, state, and federal), as well as ballot initiatives, not just the presidency is at stake this election cycle. We should continue to encourage our elected representatives to vote in a pro-gun manner. We should continue to ensure our voices are heard. We should continue to endeavor to elect only pro-gun people at every level of government. But we should also take action to ensure that as many pro-gun voters as possible are registered to vote, and actually do so. Registering new pro-gun voters takes a little effort, but isn't it worth a little bit of effort to retain your Second Amendment rights? Dave Kaplan's accurate description of challenges in obtaining a pistol permit (permit to own, really) in New York City illustrates why citizens in every state must stand watch against the massive assault underway on constitutional liberties like the Second Amendment (not to mention 4th, 5th, 6th and 14th amendments). Buying Your New York City Gun Rights, by Dave Kaplan, American Handgunner, March/April 2016. Do not sigh in relief because you don't live here. The anti-rights folks are not just coming for firearms in New York State -- or California, or Maryland, or Connecticut. While Donald Trump brandishes his New York City carry permit to cheering crowds, few realize that celebrities like Trump and Robert DeNiro will get their carry permits -- unlike the average citizen. As a resident of New York State for 30 years, I can testify that the broader situation is even worse than the specifics Mr. Kaplan cites about New York City. Firearms confiscation has already begun in New York State -- with no due process permitted. We are now in the third year of Governor Cuomo's SAFE Act which was rammed through the legislature overnight (via a "message of necessity" device) with no public hearings or public participation permitted. SAFE stands for Secure Ammunition and Firearms Enforcement Act of 2013; and it politically redefines hundreds of semi-auto firearms (rifles, handguns, shotguns) as "assault weapons" using what lawyers call a "one feature" test. So if a semi-automatic rifle with a detachable magazine has a thumb-hole stock (passing the one feature test!) --presto, it is now an "assault weapon." unbelievable. If you registered your "assault" firearm with the New York State Police as required by the SAFE Act, you can legally keep it until your death, when your property must be turned over to the state. It cannot be passed on to family. And while state authorities are in your house to confiscate the registered "assault" firearms, they want a written inventory of all firearms owned by the deceased. Additional provisions of the so-called SAFE Act (we call it unSAFE) only get worse. As State Police information systems evolve, it will require background checks on every ammunition purchase (registration by a different name). By 2018, all holders of a New York State pistol permit must be re-certified. For those of us who live here, we suspect that means more restrictions and probable revocation of some number of permits to own handguns. Remember, New York State requires a permit to own a handgun. Forget what you think you know about "carry" permits. If you do not have what is usually referred to as a pistol permit, you cannot legally possess a handgun in New York State -- period. It doesn't matter if you promise never to take it out of your house. You cannot purchase or own a handgun without this permit. And every handgun you buy is listed on your permit. The law also intrudes on mental health privacy, according to the New York Civil Liberties Union; and it violates federal HIPPA laws (Health Insurance Portability and Accountability Act of 1996), according to the New York State Psychiatric Association. Why does this matter? These provisions of the unSAFE Act are the tools for firearms confiscation. My friends and I personally know of three people who have had their firearms confiscated. The police show up at the door, seize the firearms, and deliver the owner to a nearby hospital for two hours of "observation." There is no trial, no hearing, no right to confront accusers, no due process. In other words, it is a violation of the 2nd, 4th, 5th, 6th and 1411, amendments. This is why the 2nd Amendment is about more than firearms. It is not a "single issue." It is the canary in the coal mine -- an early warning Firing Lines page 15 system that liberty is dying and it is not limited to 2nd Amendment freedom. Think of your constitutional rights as an ecological system -- a delicate balance -- an infringement on one freedom inevitably invites transgressions on others. Is this too much conspiracy theory for you? Read about the legal case of Donald Montgomery, a retired, decorated police detective and Navy veteran, who had his firearms confiscated at the insistence of New York State Police after he voluntarily sought treatment for insomnia. Reference link: American Thinker --http:// www.americanthinker.com/ blog/2015/01/ guns_ confiscated _after _man_seeks _in somnia_treatment.html Mr. Montgomery is now suing to recover his constitutional rights. As his lawsuit against Governor Cuomo makes clear: New York State has "amassed the confidential, personal health information of tens of thousands of people into a database shared by various State agencies." In addition, news accounts report that police in Buffalo, NY, track obituaries against pistol permit holders in order to confiscate firearms. If the surviving spouse does not also have a permit to own handguns in the state of New York, he or she cannot keep those firearms. "Do not ask for whom the bell tolls, it tolls for" all of us. Unfortunately, not enough of us are doing what needs to be done. I am a Life Member of the National Rifle Association, the New York State Rifle & Pistol Association and SCOPE -- Shooters Committee On Political Education. All three organizations are vital, but so is our own skin-in -the game. 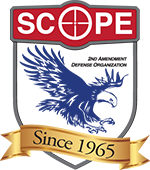 For example, SCOPE is a true grassroots organization focused on the ground game in New York State. Among other goals, it is actively engaged in getting out the vote; and here is the great conundrum as we hear the toll of the bell: Voter participation is trending in the wrong direction. Out of 15 million eligible voters in New York State, less than one third vote; and participation in 2014 was lower than 2010. What is the voter participation in your state? I and SCOPE colleagues have helped individuals fill out voter registration forms; talked to audiences across multiple counties to energize the vote; and lobbied legislators. Should Liberty Depend on Conduct of the Lawless? If citizens opt out of their right to vote, our liberty depends on an ever-shrinking pool of active voters. As that voter pool shrinks, so do our liberties. The result is more laws like the unSAFE Act -- and less freedom. A friend-of-the-court brief submitted in opposition to Mr. Cuomo's SAFE Act says it well. It was filed by the Pink Pistols, the national organization of gay and lesbian firearms owners who support the Second Amendment. It states ( emphasis added): "But to ban firearms because criminals use them is to tell law-abiding citizens that their liberties depend not on their own conduct, but on the conduct of the lawless .... "
In a positive way, our freedom does depend on our conduct: Join a 2nd Amendment Rights organization, but do more than be a member. Register to vote and/or help others to register -- then vote and get family, friends and neighbors to vote. Get involved in the political ground game -- meet with local and state legislators; support primary challenges; be visible, be vocal. Take the initiative, don't wait for the order. In other words, take the initiative where your freedom is concerned. Don't wait for the restrictive order from government. WILL THE ELECTION BE FOR THE STATUS QUO OR IMPROVEMENT? The real problem with politics is politicians. To define the problem let us better define the term "politicians." We have good people and corrupt people serving in government. So "politicians" has become the generic term for the elected officials. However, there is a big difference in attitude between politicians and statesmen. One definition for each is that a statesman looks forward to the next generation when making decisions and voting. A politician looks forward to the next election and bases his decisions and voting on "what's in it for me?" To be fair, we must realize that there are some serving in office who are somewhere in the middle of the pack. However our lives are determined by the majority of those who serve in office. When the country was founded, the men (yes, it was pretty sexist then) of influence and vision "did their duty'' and served for a term or two and then returned to productive work like fanning and business. It didn't take long before the serpent called Power raised its bead and started striking. Political parties formed and the power of corruption became evident. The Civil War was a big influence on how power became so profitable when the Carpetbaggers and Scallywags made fortunes during the Reconstruction. The roots of the tree of corruption spread wide and deep. It continues to this day with the advent of the establishment lobbyists and special interests. Many people of modest means enter politics and end their careers with substantial resources. A politician can make a good living on a political salary, but can really reap the golden harvest by becoming a lobbyist Money not only talks, but it shouts above the murmur of the crowd, and there is where most of the corruption gets its huge base. Anything from financial favors to outright bribes are evident. The recent convictions of Sheldon Silver and Dean Skelos are good examples of the temptations and lack of resistance regarding those involved. Those who get caught and prosecuted are just the tip of the political iceberg. Some have enough power and influence to stall or override investigations. A presidential candidate has a problem that the power brokers keep trying to suppress. However, the investigation is ongoing and we will have to see how that works out. Money is a huge driver in political campaigns. This quest for the nomination for president is drawing huge amounts of money in political war chests and hundreds of millions of dollars have been thrown away on failed campaigns. The media, pollsters, consultants and advertising agencies have benefited greatly by the generosity of the process. What a stimulus it makes to the power broker economy! The donations come from various sources and some even in modest donations from the people, but the big bucks come from those who benefit from having influence in the political process and what laws get passed, and even which judges get appointed to the federal courts. · What should be a fair and productive process can end up pretty slimy and pungent. The biggest tragedy is that the electorate is a part of that process. We have seen so many elections where apathy is the winner when it comes to the power brokers keeping the status quo. People are easily conned or discouraged from voting. Both are assets to those who make a living with corrupt politics. 'They can keep their toadies in office with things like laws that allow gerrymandering to protect the party vote. Some politicians keep their jobs by their ability to follow the orders of the party leaders. Every now and then a candidate can rise above the cesspool of dirty politics and be a voice for the people. He or she, if talented enough, can actually stimulate people to become active and at least point out the deficiencies in the governmental structure. Unfortunately, they are in a minority in New York where· the power structure runs rampant There are not enough statesmen to get rid of the "three men in a room= who rule like dictators. It is the most fertile field for the back room deals and opportunities for pocket padding by those who "go along to get along." The only thing that can change corrupt government is to get rid of the corrupt politicians and elect statesmen. One saving grace that can shift the power are the grass roots organizations who care enough about the next generation to get rid of the cancerous money sucking politicians and elect people who stand up for freedom and constitutional rights. There are organizations in the state. and more popping up, who are dedicated to this cause. If they can become effective in inspiring or even shaming people to go to the polls and voting the politician incumbents out and voting in statesmen, the country can be saved. Otherwise the saying "if you keep doing what you have been doing, you will keep getting what you got'' will prevail. November is coming. We shall see if enough people will become true American citizens and vote for freedom and real representation of the people. THE LAND OF THE FREE AND THE HOMEOFTHE BRAVE. FOR HOW LONG? Independence Day is approaching and it is designed to celebrate the birth of our Republic. Many good people fought and died to give America a new kind of government that was different from monarchies and dictatorships. This government was constructed to be "of the people, by the people and for the people." It was designed to give freedoms to the citizens who were supposed to be in charge of who would govern. They wanted representatives, not rulers. Yet, there were weaknesses in the origin of the country. The Declaration of Independence stated that "all men are created equal" yet they had a century of slavery. It took a Civil War to end that horrible practice. The end of this war created the professional politician who took advantage of the reconstruction of the country. They were the Carpetbaggers and Scallywags and made a lucrative business out of politics. President Lincoln may have freed the slaves, but the politicians did their best to keep African Americans under , strict controls in the South. They politicians in the southern states enacted the Jim Crow Laws which prevented, or at least controlled the freed slaves by discriminatory practices and racism. Voting was restricted by poll taxes and requirements that were difficult for black people to pass. There were separate rest rooms and even drinking fountains in public places below the Mason-Dixon Line. Justice came in two different systems, one for blacks and one for whites. The schools were segregated and the manner of educating children was not equal. The politicians created the myth that the schools were "separate, but equal." That was a political myth used as a slogan by politicians. It was discriminatory and totally unfair. It took another century for the Jim Crow Laws to be abolished. The laws were introduced by politicians and signed into law by governors and law enforcement was eager to enforce these laws. Brutality was common. Justice was subjective depending on what side of the tracks a person lived. Two world wars came in the Twentieth Century and even the military was segregated. Racism was condoned by the government. President Franklin Delano Roosevelt had Japanese Americans placed in prison camps because of the bombing of Pearl Harbor and the negative feelings about Japan. Yet, there were companies of Japanese-American soldiers who served with honor in the European campaign. It started out that African Americans who served in the military before the Pearl Harbor attack were relegated to kitchen duties as cooks or servers. It was highly unusual for any to become involved in regular military duty until the war in Europe and the Pacific was underway. Even then, many of the units were segregated. The African American troops served with honor and the military relaxed their segregated ways. At least they said they did. By the 1960's the military had integrated forces, but the military posts below the Mason-Dixon Line still had a problem. The post was integrated, but the cities and towns outside the post were not. White and black soldiers could not go outside the post and have a meal or a drink with a buddy in the local establishments. This columnist had a very unpleasant discussion with the owner of a drive-in carhop restaurant when not served and kicked out of the parking lot because his friend was an African American. It was a valuable lesson learned. Even with a Constitution and a shifting in laws, the residue of discrimination still pollutes our society. However, fixing a problem can lead to other ones. One of the biggest problems we face is the one of being "politically correct." This is a situation where confusion abounds. For example, the Second Amendment has been eroded since 1934 and crooked politicians have been trying to destroy it since then. Gun control was born in the South and grew up in the north. Talking about the Jim Crow Laws brings up the unpleasant subject of the New York State SAFE act. It was passed literally in the middle of the night with a "message of necessity." This is difficult to justify considering that some of the provisions took a year to implement and some are still not being enabled. It even has a provision that, when enforced, deprives a person of four amendments in the Bill of Rights without due process. Due process is a keystone of the democratic process, yet the inept politicians passed the bill and it was signed into law by the governor. The Fourth of July is a day for celebration of the freedoms we should be able to enjoy and they are our constitutional right. We should use this day to reflect, praise the veterans who gave their service to protect those rights and freedoms. We should look to change the political makeup of the state and federal governments by removing the corrupt politicians who are eroding and infringing on our freedoms. The freedoms are ours to cherish and keep, or to lose. It is up to us to determine whether we are going to be content with the status quo that is robbing us of values and quality of life. This is America. Let's keep it the land of the free and the home of the brave. I'm sharing this story as to show how the insanity of the New York State SAFE Act has lowered the quality of life for not only myself, but all New York residents. I enter many competition matches throughout New York, and was recently invited by a good friend to go along on a trip to the CMP store at Camp Perry. Ohio, to be part of the CMP program to buy rifles recently released by the Federal Government. These rifles are for sale to the active members of the Civilian Match Programs (CMP). There were thirty Ml A Carbine surplus rifles to be released the next morning on a first come, first served basis. So there we go, on a 315 mile journey, to the free state of Ohio to take our chances, to try to get one of these pieces of om history to add to our private collection, and to compete in the MIA Carbine Matches. We arrived at 4:30 pm to find the store closed. People were already in line for the 8:30 am opening and a chance to get one of these beauties. It's 30° outside, and only getting colder off the Jake as the night goes on, but these folks don't care. They were ready in their cold weather sleeping bags and layers of thermal underwear, ready for the morning to come. Everyone put their name on the signup sheet to keep the order, and to avoid confusion come 8:30 am. At 3:00 am, a young, bot very helpful and friendly State Highway Patrol Officer stopped over to see what we were up to. He became our hero as he had knowledge of the only place within 30 miles that was serving fresh, hot coffee. Off I go to get 20 cups of hot coffee, leaving my partner behind to keep my #10 spot locked up as up to 30 more people had arrived by this time. The 20 cups of coffee instantly disappeared as it was now 28°. Finally the sun comes up, and the now new band of friends pack up their cold weather gear and prepare for the store to open. At 8:30 am the doors open and there is now 138 people in line trying to get a chance at one of these beautiful rifles. I'm thinking about how lucky I am to be #10 in line, not only do I have the chance for one of these rifles, but I'm one of the first to get inside and get warm again. We were outdoors for 12 hours at 28- 32 degree temperatures. Nuts? Yes. Fun? Absolutely, as I met a bunch of folks from all over the country, just like me. This is where the story gets better. Finally at 11 :30 I get called to the counter, and in front of all these people I had just gotten to know, a lady says, ''I CAN'T SELL YOU THE RIFLE. YOU'RE FROM NEW YORK. The rifle has a bayonet lug, a removable magazine, and they just sent us a text not to sell this rifle to you." She held up my paperwork and said, 'There's nothing we can do folks, he's from New York, we get our rifles from the government and we have to follow their rules." They took the tag off my chosen rifle and returned it to the rack where a very lucky guy from Illinois ran over and grabbed it up declaring that he felt like he just won the lottery; you see, he was #86! I have never been so ashamed to be from the state of New York as I was then, and am now! I ended up buying some ammo and leaving in disgrace, feeling ashamed of my state the entire 315 mile return trip home; that doesn't feel like home anymore. So tell me again how the SAFE Act is such a good thing. Tell me how it won't affect legal NYS gun owners. My statement: If you own guns, hunt, and/or belong to any club or organization in New York State, and you didn't vote; It's your fault this has happened. If you didn't vote against Cuomo. you are an enemy of freedom. These freedoms and rights were paid for by the blood of Good Men. If you couldn't be bothered to vote, shame on you Cupcake. Go have another beer. No! Please, not another article on the upcoming election. If you're like me you're shaking your head at the shenanigans this election cycle. The name calling, the endless waiting for Hillary to be or not to be indicted, the pundits trying to explain why this or that primary defied their predictions as well as their best attempts to tear down candidates is wearing thin. We haven't hit the conventions yet. So I promise this will be a short one. One of the biggest reasons this election is important is the Supreme Court. The death of Anton Scalia, Supreme Court Justice has left a serious threat to the balance of the court's ideology. Replacing Scalia wjth an equally conservative or constitutionalist justice would keep the balance of the court slightly conservative barring the president's desire to have his nominee, Chief Judge Merrick Garland being put to a vote. If Hillary becomes president we will likely see her nominee tip the court over to the progressive side. Add to that there will likely be retirements during the next president's term it could well make the court solidly left leaning. If Trump is elected there is a good chance bis nominees would be conservative or lean that way. With Hillary we know what we will get. Another important reason is that the leading democrat candidate, Hillary Clinton has pledged to close gun stores as well as firearms manufacturers. I will remind you Bill Clinton shut down about two thirds of the legal gun dealers during his presidency. By the way Bill did it without the consent of Congress, he did it by changing property zoning and regulations specific to firearms dealers. Hillary's plan is to remove any immunity from lawsuits generally given manufacturers and allow gun manufacturers and sellers to be sued for all damages, injuries and casualties from the misuse of their products. It would be as if Ford or Chevy were sued every time one of their cars was in an accident or driven in an illegal manor (any traffic offenses). With her as president thousands will lose their jobs and their businesses. Hillary has also embraced a Federal gun registry as well as a gun owner license. Of course banning so called "assault weapons" is also high on her list. Rounding out the major part of her anti-gun wish list is smart gun technology and mandated separate locked storage for both guns and ammo. Trump has said he is pro-gun, in addition several of his children are enthusiastic shooters. He is not going to go after gun manufacturers or gun shops. There is much at stake. I am not saying Donald Trump is the best candidate in the world, I am saying he is the best candidate when the other choice is Hillary Clinton. There are a number of "never Trump" talk show hosts. Each claims this or that candidate can win if... In my book it will be a face off between Trump and most likely Hillary, unless the FBI recommends incitement for her. Should it happen it will get even more interesting. Will Bernie Sanders be drafted, perhaps VP Joe Biden? Andrew Cuomo's name has even been whispered. Of course President Obama could just pardon her or have any indictments buried. On Fox News, Rudy Giuliani gave odds of 60/40 on incitement. We shall see. This November is coming up fast. If your not registered, please register. Encourage others to register and vote. New York 147th District Assemblyman David DiPietro and Brian Krawczyk, of Wethersfield, have a proven track record of educating the public on gun issues and defending the Second Amendment. Earlier this month, the New York Shooters Committee On Political Education (S.C.O.P.E.) honored the two men at its annual banquet in Hamburg. DiPietro was presented with the Sandra Lee Wirth Memorial Legislator of the Year award for his tireless efforts to protect Second Amendment rights in Albany. "The first vote I had to make in Albany was in opposition to the S.A.F.E. Act," DiPietro said, "And every year since. I have sponsored a bill to repeal the S.A.F.E. Act". Last year the assemblyman was honored by S.C.O.P.E. with their Thomas Paine Award for Excellence in Defense of the Second Amendment. DiPietro has put a lot of effort into educating his constituency through numerous town-hall-style meetings throughout the 147th District. "I don't usually get involved, but since David was so serious about sticking up for our gun rights, I had to help," said Bill Walters, a gun rights activist from Strykersville. Walters helped organize many of the informational sessions for DiPietro's constituents. Krawczyk was presented with S.C.O.P.E. 's Thomas Paine Award for Excellence in Defense of the Second Amendment. Revolutionary War re-enactor Tommy Thompson presented the award after quoting Thomas Paine: 'These are the times that try men's souls. The summer soldier and the sunshine patriot will. in this crisis, shrink from the service of their country; but he that stands now, deserves the love and thanks of man and woman." When accepting the award. Krawczyk felt obliged to finish the Paine quote by saying: 'The harder the conflict, the more glorious the triumph." Krawczyk, a member of the Wyoming County S.C.O.P.E. chapter, is very active in gun safety education in Wyoming County. He teaches the Wyoming County mandated Pistol Permit Class, is an NRA Laser Pistol class instructor, and is president of the Wyoming County Wildlife Federation. His efforts have educated many on the mechanics of responsible gun ownership, outdoor sportsmanship, and fair pJay. After the S.A.F.E. Act was enacted, Krawczyk produced a presentation that was circulated throughout the state. He is also very proactive in educating youth in outdoor sporting skills like hunting, trapping and fishing. "If it wasn't for volunteers like Brian Krawczyk, there wouldn't be a Wyoming County chapter," said Mark Yount, president of the Wyoming County S.C.O.P.E. chapter. Schuyler County S.C.O.P.E. has had a busy summer attending local events and meeting candidates running for election. On August 5-7 Schuyler S.C.O.P.E. had a booth at the Watkins Glen Italian fest. We were joined by Millport Hunting and Fishing Club and the Odessa Community Conservation Club. Jointly, we were promoting our current fundraising efforts to assist the Schuyler County 4H Youth Shooting Sports Program. The new program has started with the archery discipline and air gun will follow shortly. The Millport Hunting and Fishing Club also joined this effort by providing their grounds as a venue for the 4H program. Some generous members of S.C.O.P.E. and the Millport Club have attended the 4H training and have become program instructors in various disciplines. On October I, Schuyler S.C.O.P.E. will have a booth at the Montour Falls Harvestfest. Last chance voter registration will be a theme at this event as with all events we attend. The Chapter currently has a raffle ongoing for a 16-gun safe, a reloading kit and a patriotic soft rifle case. The winners of the three prizes will be drawn at our Oct. 13 meeting. Democratic NY Senate candidate Leslie Danks-Burke addressed our August 11th meeting. She is challenging the incumbent, Senator Tom O'Mara, for the NY 58th Senate District. Danks-Burke stated she was pro 2nd Amendment and acknowledged that she felt the NY S.A.F.E. Act has major errors. The newly installed S.C.O.P.E. NY President, Tom Reynolds, also attended our August meeting, introduced himself and addressed the Chapter on current S.C.O.P.E. business. NY Senator Tom O'Mara attended our September 8th meeting. He gave a briefing on the current NY Senate makeup, proposed legislation and critical Senate races around NY State. He was very concerned that if the Republican conference loses control of the Senate that more onerous gun control bills will be passed. Our current A rated Assemblyman, Phil Palmesano, is running unopposed in the 132nd Assembly District. The Ontario County Chapter of SCOPE -- we are doing our Job' too well. A question I keep asking myself, is why we don't have the response from our members that they have in the Wayne, Yates, Genesee, and Steuben County chapters? We have members, but, very few are active. Some people in the county see that there is a problem, but for various reasons, think that throwing $25 a year at SCOPE will solve it. Most gun owners seem to be satisfied with trying to live with whatever Albany throws at them. However, can you spot a trend? The last 20 years have seen a lot of "stuff' come our way. It's not going to get any better. As soon as 'little duce' thinks he can do it, more onerous regulations will be coming. How would you like getting a prescription for sleeping pills, and having the state police show up to seizeall your guns? IT'S HAPPENING NOW!! IT WILL GET WORSE!! Why don't we have more active members? Is it our leadership? Basically, our leadership are those who show up on a regular basis. This is a volunteer organization. if there is a lack of volunteers, there will be a lack of capability. So, those who at least recognize that there is a problem, have to accept more responsibility. Become more active, and get more members. Otherwise, prepare for the "knock on the door", and to hand over your guns. Anybody who says anything different is sleepwalking through life. When you consider how municipalities manage property... do they have an obligation to see to it everyone has a voice? In the instance of Margaretville, New York in the Catskill Mountains, the local Chamber of Commerce hosts a Cauliflower Festival on a large public venue in a field maintained and operated by the village. This festival stems from the historical context of local farmers raising cauliflower up until about twenty years ago. The Catskills have also been the wilderness for many people where they could hunt and fish and generally enjoy the outdoors. The use ofguns and a society raised in that culture permeate the county. In fact, Delaware County, NY is the only one out of 62 in NY that remains a .. "shall issue" pistol permit location. In a recent move to increase S.C.O.P.E. 's influence in the area, a new committee formed under the leadership of Andrea Elliot. She suggested we inquire concerning our ability to obtain a booth space (at this venue). Our intent is to address the issue of voter registration,pass out registration forms, and colIect them to deliver to the Board of Elections in time for the November polls. Many of you know of the lack of participation by gun owners in the last election where Cuomo won by some 500,000 votes. For a community like Margaretville, in a county like Delaware, it's important the gun owners retain a voice in their government. Mrs. Carol O'Beime, Executive Director of the Central Catskills Chamber of Commerce, turned down a request for a booth space with these words... "This is a community festival, not a forum to bring up issues that seem to have become political. People want to get away from all of that and we aim to provid (sic) a place where we can offer that. Not the time or place. It is our policy." I don't know the origin of the concept of not talking about religion or politics in public. I do know I've heard it for some sixty years. The policy detracts from honest discussion and continues to lead us in a downward spiral throughout our society and culture. S.C.O.P.E. is a nonpartisan, non-profit 501(c)(4) social welfare organization. The denial of a local community group like S.C.O.P.E. to offer an opportunity to register to vote and discuss matters of public interest on a municipal piece of property, seems to fly in the face of our First Amendment rights.